Happy New Year from Georgetown’s Art Attack! Start the new year off on a good foot, join us in our resolution to bring you the best, brightest and ever expanding industrial, contemporary visual and performing arts/artists at over 40 locations! The FREE Art Ride stops at many studio/gallery locations and can bring you full circle complete with a tour of our west end locations such as studio e, SANCA and Equinox Studios for live demonstrations, open studios, music and fun! Fantagraphics Bookstore & Gallery presents Jim Woodring‘s FRANK IN THE 3RD DIMENSION book launch party and signing with Jim Woodring and special guest Charles Barnard. Krab Jab Studios exhibit Well Played: the Art of Tim Bruckner opens on Saturday, January 9, 6-9 pm. Sculptor of toys and action figures, artist Tim Bruckner is best known for his DC Comics resin casts of Superman, Wonder Woman, and other superheroes and villains. Now retired, he gets the chance to create his own cast of characters! Tim will be in attendance. studio e presents: Curtis Steiner & Tobey In Blue: a calligraphic installation, an installation exploring the dimensional possibilities of a line drawing. Line-light-shadow-layers-shifting perspective, created out of mundane materials; drinking straws and a candle. Opening reception January 9th 6-9 pm. Additional hours: January 15- February 6th open Friday & Saturday 1-6 pm. Machine House Brewery is exhibiting a new show of photographs: Andy Porter – Wild Northwest – A Benefit for Washington Brewshed . Andy’s work documents the way mountains and rivers and forests demand our attention and take control of our emotions. Andy and Machine House are working with Washington Wild and their Brewshed program to help them give our natural surroundings the respect they deserve. 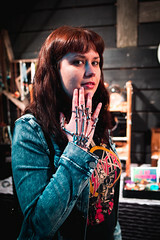 Equinox Studios is a growing arts community in West Georgetown, home to over 100 artists working in a staggering array of mediums, including blacksmithing, welding, woodworking, cycle fabrication, sculpture, painting, film, glass, ceramics, photography, performance art, music, and more! Hop on the free Art Ride shuttle and join Equinox for live demonstrations, open studios and fun! 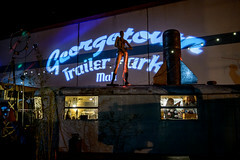 Georgetown Trailer Park Mall Calling all songbirds! The Georgetown Trailer Park Mall is hosting a WINTERAOKE BASH! for January Art Attack, and your beautiful pipes are needed. We’ll have an awesome tune selection, and a cozy fire to help keep you warm between songs. Join us on January 9 from 6-9 pm, and let’s show this neighborhood what vocal art really sounds like! Mainframe Shop presents Movement in Kind: Matthew Whitney. Matthew Whitney’s evolving body of work continues to explore the relationship of time, movement, place, and their representations in both digital and physical media. This exhibit features new works in the series following several exhibitions around the Pacific Northwest from 4Culture in Seattle to the Boston Center for the Arts in Boston Mass. Special closing engagement on Saturday, January 9th, 2016, 6-9 pm. Illumination Studio presents Rostad and Ferrell. Rostad explores the inner beauty of our neurological system through abstraction and vibrant color and Ferrell exploring space and color field through abstraction and vibrant color. 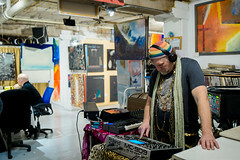 Also, music by Luscious Leopard Lips, the Georgetown atmospheric music DJ with a Theremin synthesizer. 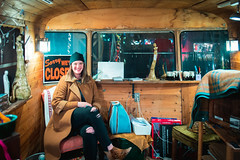 Zippy’s Winter Wonderland: A marvel of an art show continues into the new year. Andrew Schons‘ Winter Wonderland show is part installation, part art gallery, and features primarily acrylic pieces & prints. Tim Bruckner @ Krab Jab Studios, Jim Wooding @ Fantagraphics Bookstore & Gallery, Tammy Perry @ All City Coffee, Curtis Steiner @ studio e, Syd Sherra @ Equinox Studios, Andy Porter @ Machine House Brewery and Ferrell @ Illumination Studio, Andrew Schons @ Zippy’s and Winteraoke Bash @ The Georgetown Trailer Park Mall.